*Note: The yarn used in this pattern has been discontinued. It may be substituted with yarn of similar gauge. Cast on 72 (80) stitches. Begin stockinettte stitch. Continue till piece measures 9.5"(10.5") from beginning. Cut yarn, leaving a tail of about 24" long. Thread yarn through all stitches and remove stitches from knitting needles. Pull tightly together, and with right sides facing each other, sew seam from top of hat till 2.5" from the edge. Turn hat to the right side and with wrong sides facing each other, sew rest of seam. Place hat in normal cycle of washing machine, warm water. Once cycle is complete, remove hat and place in dryer on regular heat for 20 minutes. 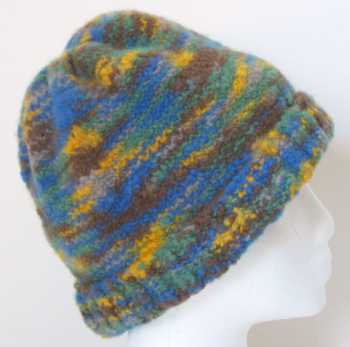 For a more felted hat, place in dryer for a little longer. For a less felted hat, remove from dryer after 10-15 minutes. Shape hat according to size. Let dry fully before wearing. Note: Hat is only partially felted so as to obtain a warm and thick fabric, and at the same time retain some of the elasticity of a knitted fabric. If a fully felted hat is preferred, leave in dryer for a longer period. Make a pom pom and attach to top of hat after the felting process.